If you have an allergy to mold, its presence in your home can make you feel miserable. More importantly, though, mold spores can impact your health negatively, making it difficult to enjoy the activities that you love to do. The symptoms triggered by mold exposure vary from one person to another in severity as well as in type. For each person, the immune system identifies the spores as foreign particulates. The body's response varies, depending on the individual's level of sensitivity to the mold spores as well as to existing health factors. The list of common symptoms you may experience due to a mold allergy is long. The symptoms resemble what you may expect from a cold or hay fever. In addition to sneezing, you may have a runny nose that keeps you reaching for a handkerchief or tissue all day long. Postnasal Drip that leads to coughing. Irritation to your eyes, causing them to feel itchy or water for no apparent reason. Your nose and throat may feel itchy or scratchy, requiring the continual use of cough drops to soothe the irritation. Mold allergies have also led to dry skin that eventually develops scales, creating even more irritation and discomfort. Although more than one hundred kinds of mold exist, only some of them are known to cause allergic reactions like Brown and Black Mold. Higher concentrations of mold spores are likely to cause more serious reactions in individuals who are predisposed to allergic reactions to them. For people who live in older homes with damp basements, the symptoms may occur all year. For other individuals, their symptoms may occur only during the winter or rainy seasons. Hypersensitivity Pneumonitis; a condition leading to serious inflammation of the lungs due to exposure to mold spores. Allergic Bronchopulmonary Aspergillosis; a condition affecting the lungs of individuals with cystic fibrosis or asthma. Allergic Fungal Sinusitis; an inflammation of the sinus passages. Perhaps the most commonly experienced severe reaction to mold spores occurs in people with asthma, a respiratory disease in which breathing becomes restricted as the individual's airway becomes inflamed. Wheezing, shortness of breath, tightness in the chest, and coughing are symptoms of asthma. When asthma and a mold allergy are both involved, the individual is likely to experience a severe asthma attack when exposed to the mold. When a person breathes in mold spores, the immune system responds in ways that are unpleasant. While prescriptions and over-the-counter medications can help to manage your symptoms, reducing your exposure to it produces better results. 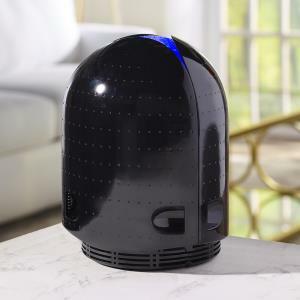 One of the options you have is to use a HEPA Air Purifier to help eliminate mold spores from the air you are breathing.